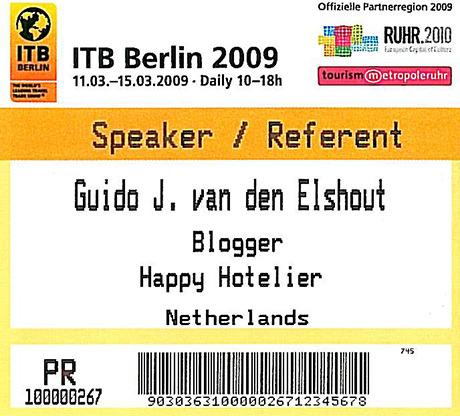 Hence I’m an officially “Approved Blogger” and may attend the second Tips from the T-List – PhocusWright Blogger Summit At ITB 2009 in Berlin. Here below is the provisional list of Bloggers who will attend. I took this provisional list from the PhocusWright site, but had to edit it heavily, as it appeared that a typo monkey had inadvertently inserted a certain link over 80 times into this page….maybe someone was being paid in kind for his speaking at the summit. Many new faces to meet. Am looking forward to it. 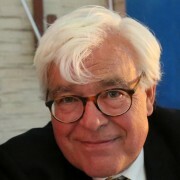 Many new faces from the German language scene, which is a good thing as they have a circuit of their own and it is time to have them connect to the outside world. For me it is necessary to do some research on the new faces as I’m planning to take a lot of photos like last year and to publish them more timely than last year. Yes I can! Claude Benard • HOTELITOUR • France, who couldn’t make it at last. Patrick Landman • XOTELS • Spain, who I didn’t see at all. Thank’s for the mention : ) I’m looking forward to meeting you in Berlin! Guido, Iâ€™m not sure if you were joking in this post, but even so I do not appreciate being accused of getting paid in links for my appearance at an event.. I suspect the HTML was messed up somehow, no idea why my URL appears so many times in the source code. Maybe you should check your facts before saying such things? Well Guido, I didnâ€™t take it as a joke, I am not a coder so I have no idea why that would happen. A lesson here is donâ€™t blog about something without knowing your facts (something I learnt a while back) â€“ accusing me of taking links in return for speaking at the summit is not in very good taste. I was joking, off course, but with a bit serious undertone. I was not accusing you. I certainly didn’t want to upset you. I apologize if I did upset you. Only those who would have a serious look into the source code would be able to pinpoint you. I don’t expect many of my readers would do that. They would also notice that you were not the only one with more than one link. It is obvious that it is not you who would have a hand in that. If you prefer I’ll rephrase and change your comment as by your comment the link to you is now in the open. The fact is that there are many superfluous links in that page. And that is the bit serious undertone and the reason I made the comment, because I’m a bit surprised a serious and well respected organization as PhocusWright does that, probably inadvertently. It also demonstrates that you cannot be too careful with editing and coding when you publish something on the world wide web. Guido, thanks for putting this list of links together. I look forward to meeting you at the event. Will I see you tomorrow at the blogger’s events? Would be nice to catch up again! Glad to be able to catch up!